I know you’re getting sick of me telling you how much I love Mexican food, but I’m not sick yet of cooking it so….we’re kind of stuck on that one, sorry. I made this last weekend for my friends Corey and Patrick and WHOA was it good. It’s also super duper easy! You’ll love it, I promise. You’ll also love the fact that the whole thing is made in exactly one pot – woohoo! 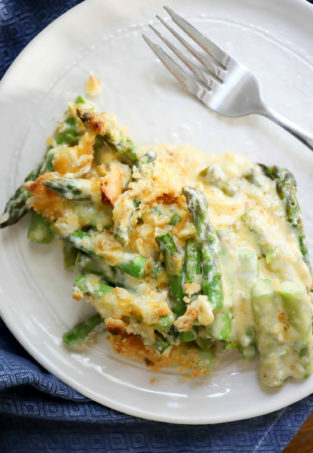 To make this, we cook the veggies, and meet separately then layer them back with lots of cheese to heat through and get married and be perfect together forever. It’s easy and hardly takes any time! To speed up the process you could cook the elements all in separate pans and then combine them right at the end for an even faster preparation, but then you’d have to do more dishes so….that one’s your call. I can’t help you. 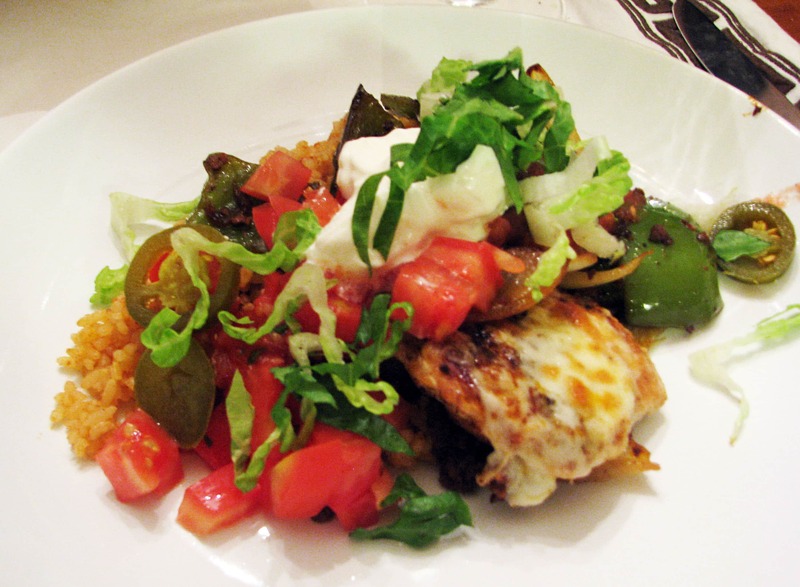 Mexican Rice, for serving – my version is really easy! 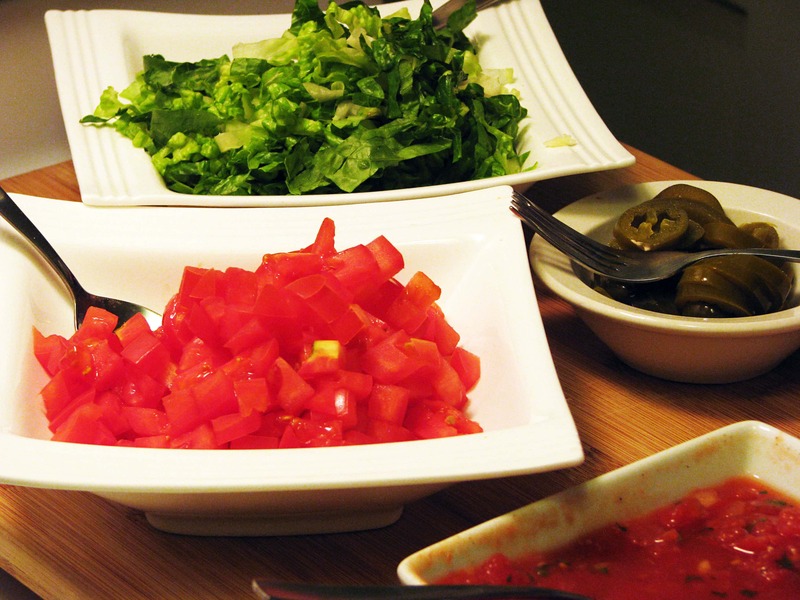 Toppings – whatever you like on Mexican food! I like tomatoes, lettuce, pickled jalapenos, sour cream, salsa, and guacamole. I cook the chorizo first because it makes the pan taste like sausage, and then everything you cook after that tastes like sausage, and then everything tastes like sausage. 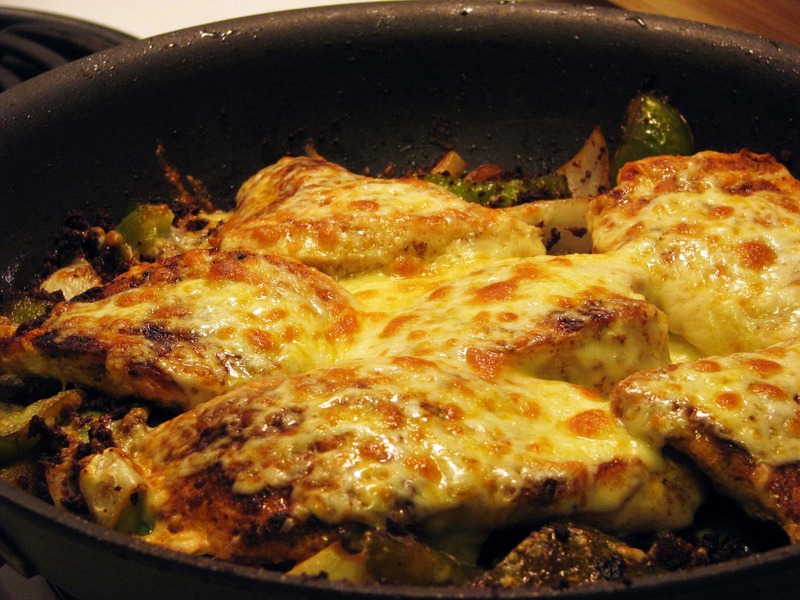 But, you can really cook the chorizo, chicken, and veggies in whatever order you like. 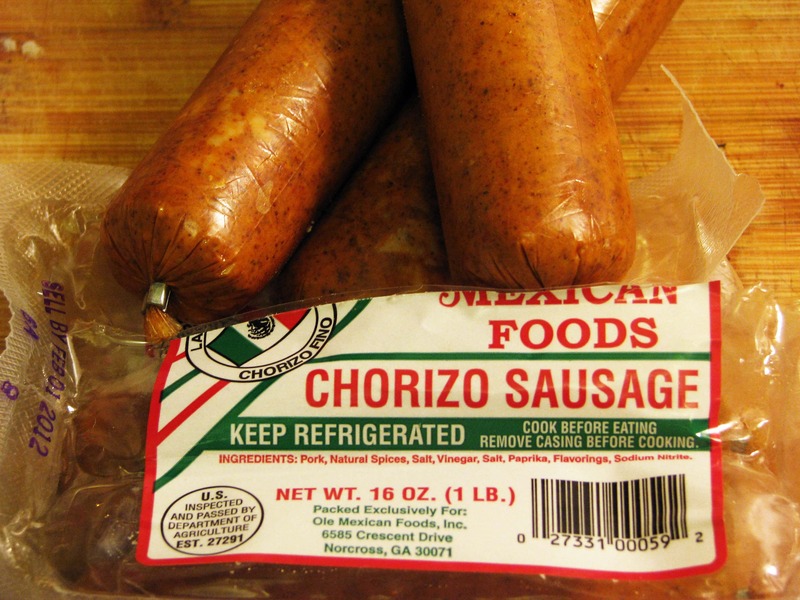 Isn’t chorizo great? 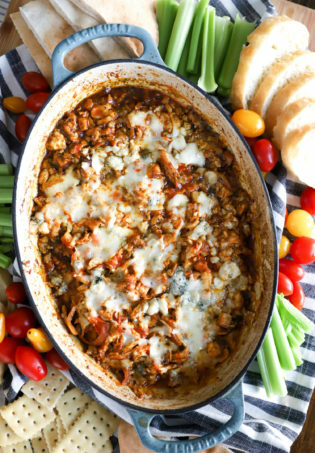 It’s spicy, meaty, flavorful, and crumbles beautifully! I used three of these 5-inch links. 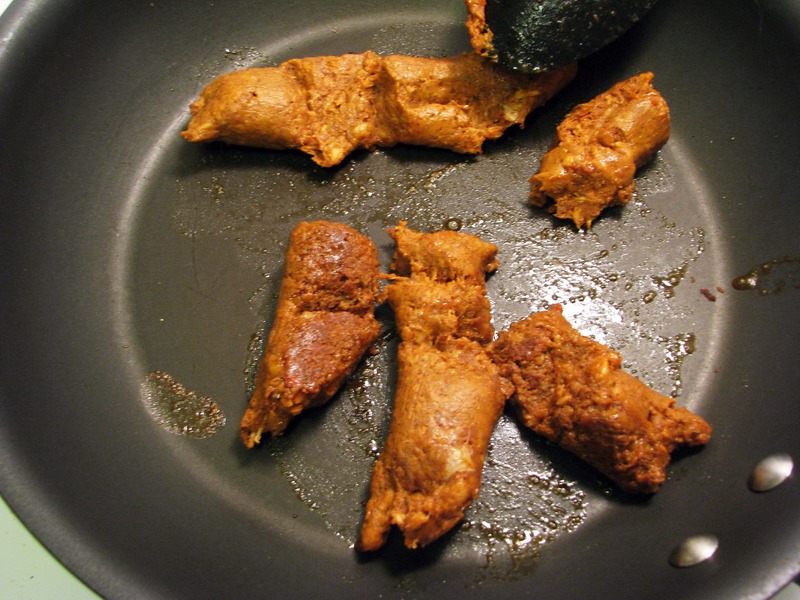 The casing on chorizo is usually plastic, so cut off the tip of the sausages (just the tip, just a little….sorry) and squish the meat into a pan over medium heat. This just invites a LOT of jokes relating to excrement and/or genitalia, doesn’t it? I mean, not from me…just from other people more immature than myself. 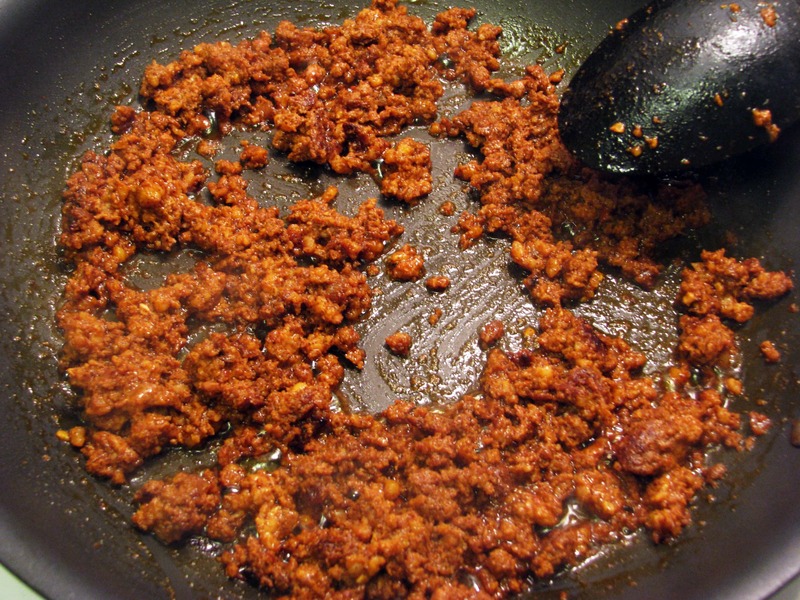 Add all the chorizo to the pan and don’t go nuts trying to crumble it up: wait until it’s started to brown a little bit and it’ll break up much easier on its own. 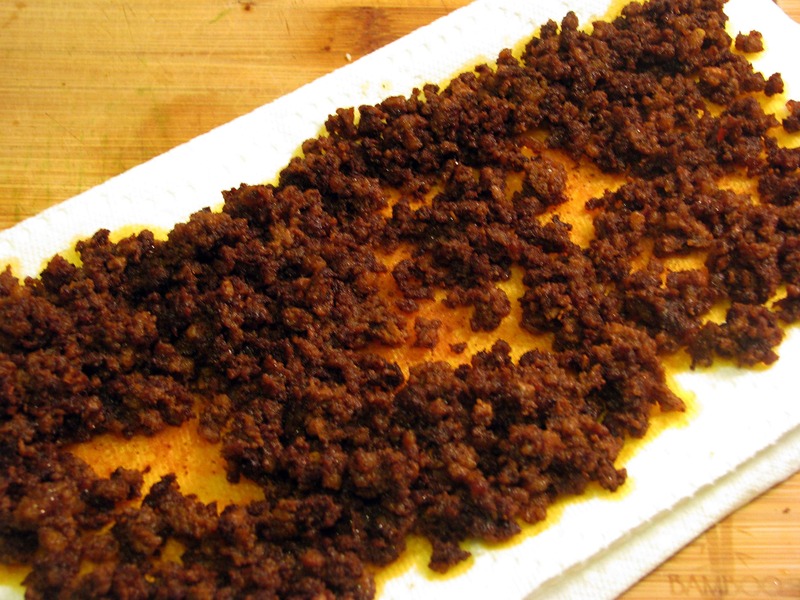 Brown the chorizo for about 10 minutes, breaking it up as you go until it’s very crumbly and some bits are crispy. Mainly….I could just eat this and call it a day. It’s SO dang good. For real. 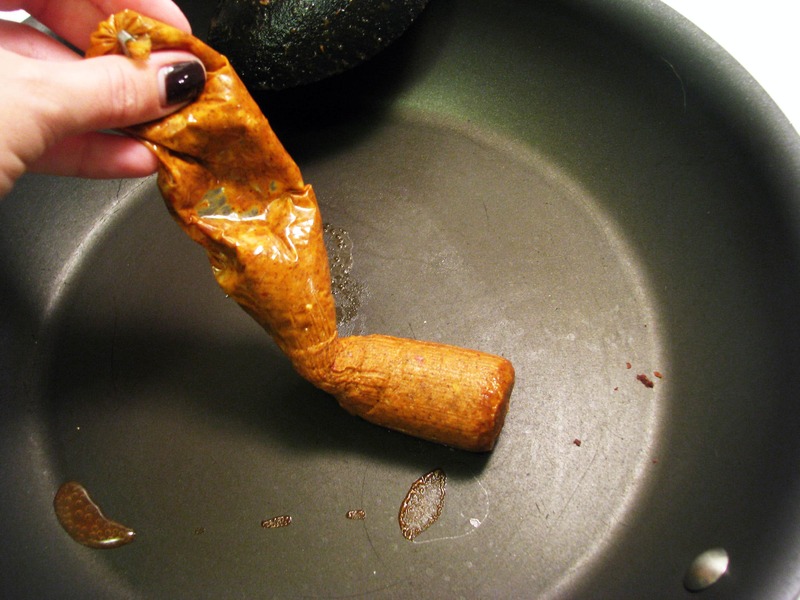 When the chorizo is cooked through drain it on paper towels. 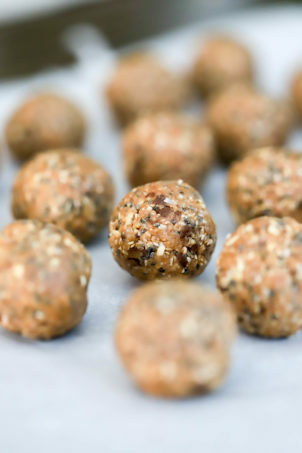 Let it hang out and drain – it can’t hurt to get sooooome of the fat off, right? I know. While the chorizo is cooking I usually start the chicken so that it’s ready to go in the pan when the chorizo is done. 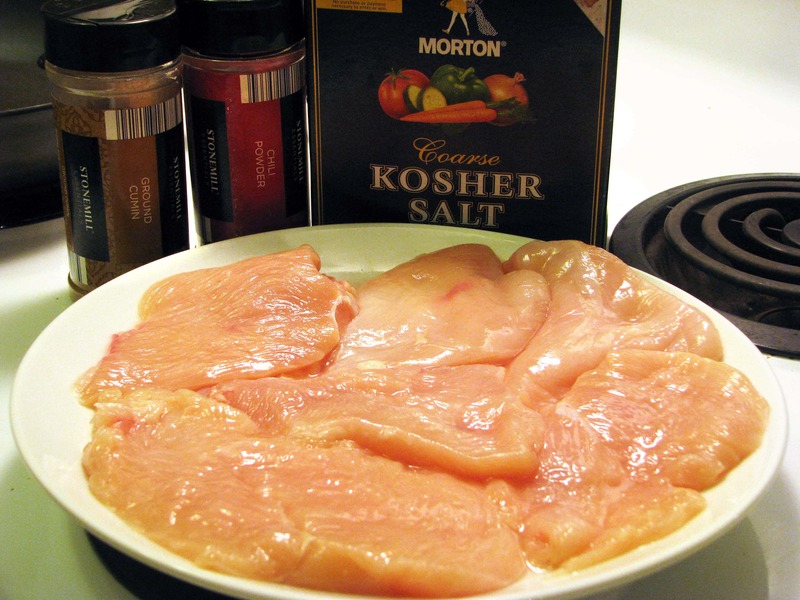 For 4 portions, 3 chicken breasts is plenty. I cut them in half THROUGH the breast so you get 6 thin chicken breasts. 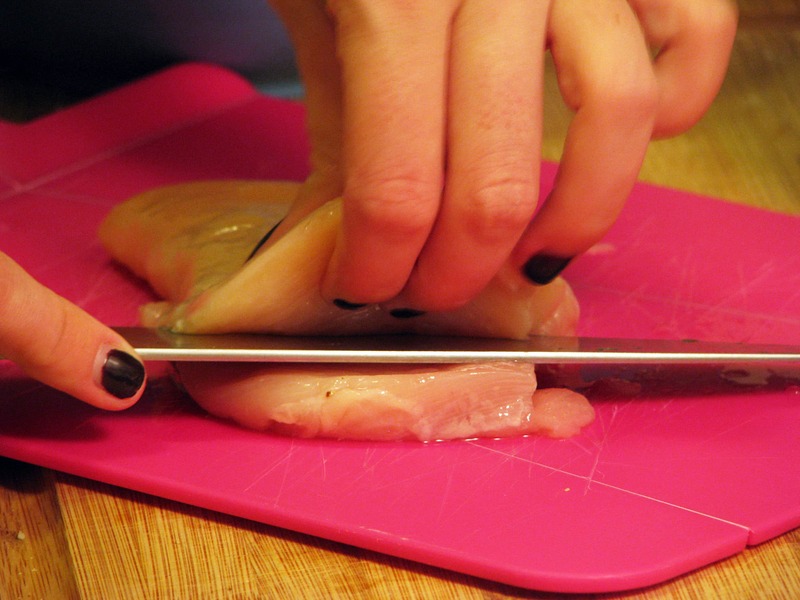 This isn’t that hard, just go really slowly and make sure your knife is sharp. No biggie! 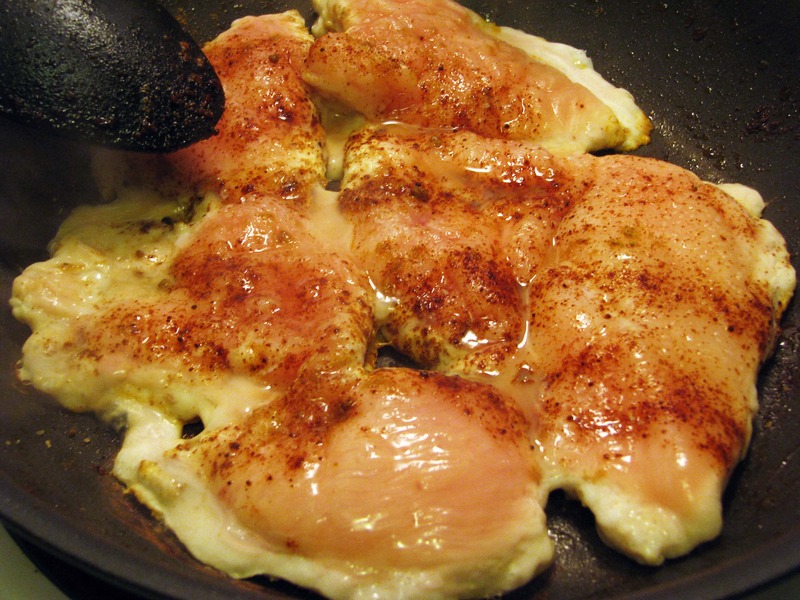 Put the chicken flat on a plate and sprinkle both sides with salt, cumin, and chili powder. I sprinkle the top side, and then use tongs to put the seasoned side DOWN in the pan with the naked side on top, then I sprinkle the seasonings on the second side right in the pan – it’s easier that way. Let the chicken brown on the first side for about 4 minutes until you can see the edges turn white, then flip it over. If the pan gets dry add a drizzle of olive oil. Let the chicken cook on the second side for two or three more minutes until the chicken is BARELY cooked through. It’ll keep cooking as it rests and again in the oven soon, so don’t freak out about it. 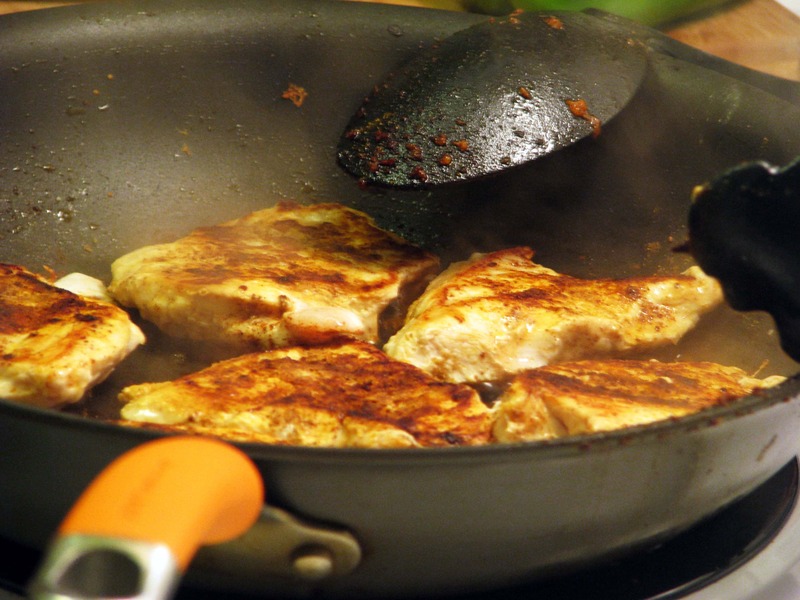 Remove the chicken from the pan just like the chorizo and add another drizzle of olive oil. 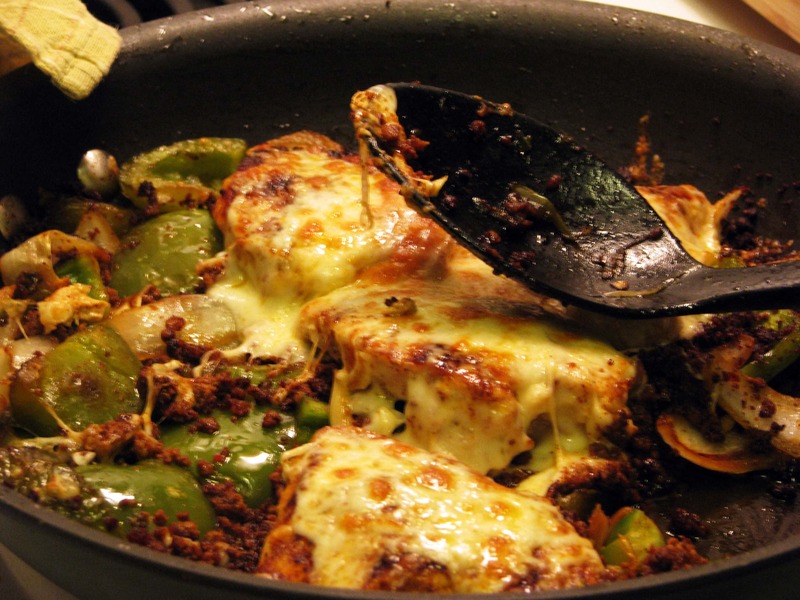 Cut the onion and green pepper into large chunks – I like them to have a nice contrast in texture and size to the finely ground chorizo and big pieces of chicken, but you could CERTAINLY cut everything all the same size like fajitas to mix things up! 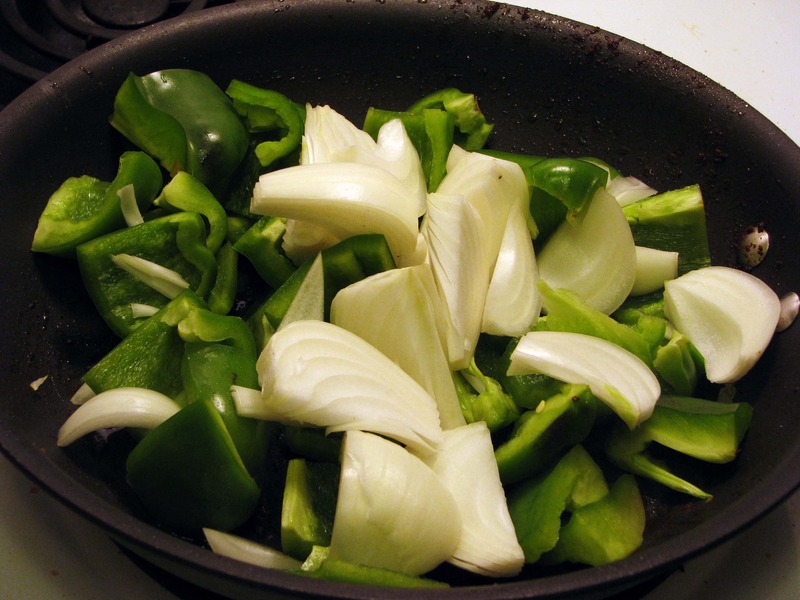 Turn the heat on your pan up to medium high – we want the veggies to blacken on the edges! 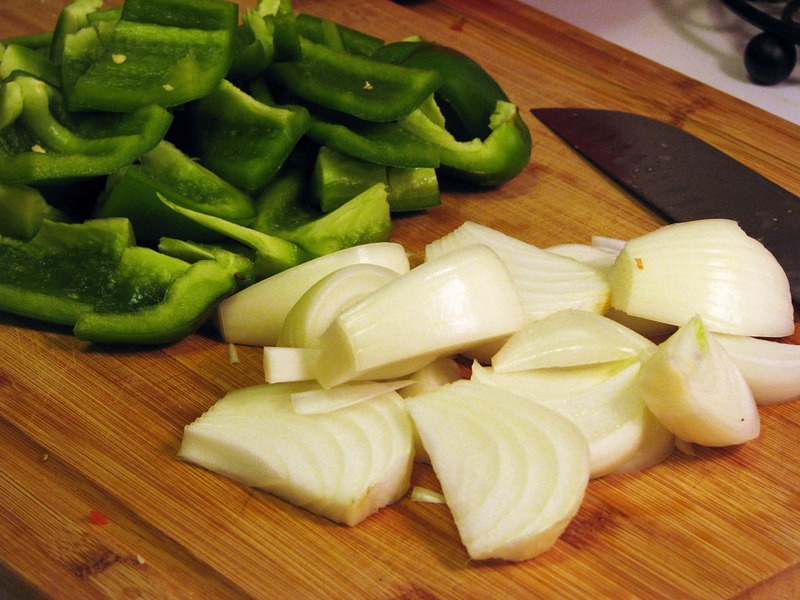 Add the veggies to the pan with a sprinkle of salt – not too much! 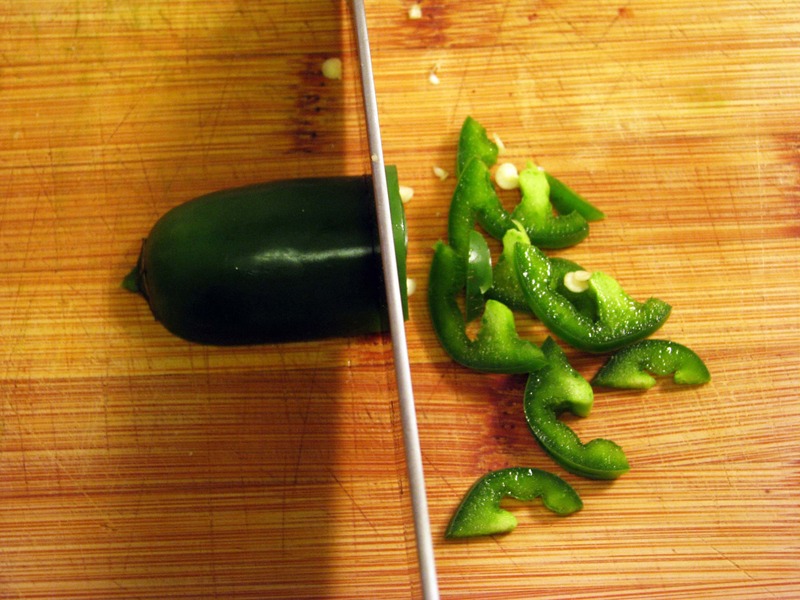 Thinly slice the jalapeno, and add that in with the veggies too. At this point, turn on the broiler if you’re going to serve this right away. Grill the veggies in the pan until they are dark on the edges and halfway cooked through, stirring occasionally, for about 7 minutes. 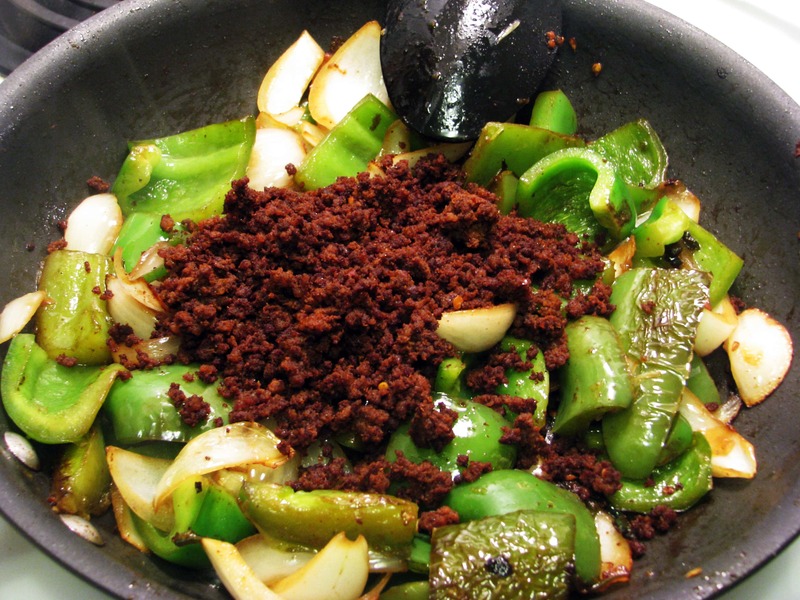 Then, turn off the heat to the pan and sprinkle the chorizo over the veggies in an even layer. 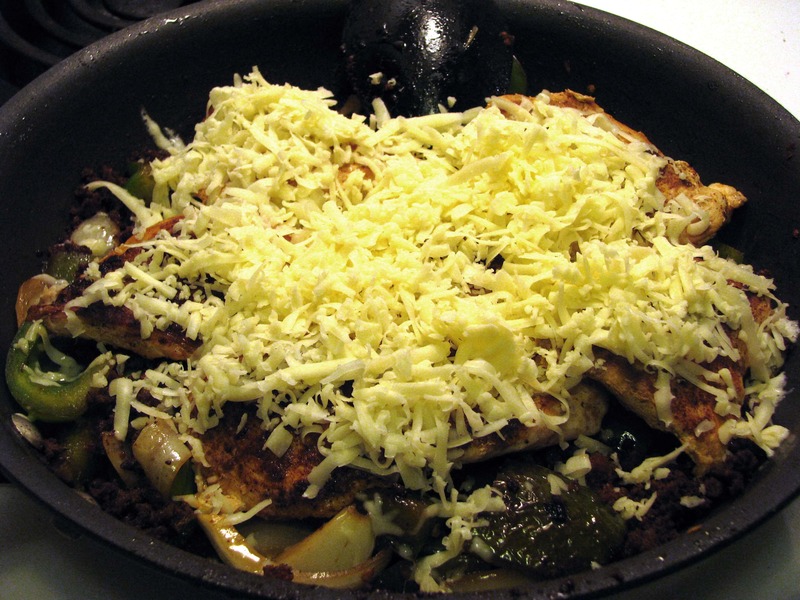 On top of the chorizo, add the chicken in an even layer and top with the cheese. Well, that’s just gorgeous isn’t it! It is. If you’re going to serve this right away, stick it under the broiler for 5 minutes and call it a day. Get your toppings ready too! If you want to make this ahead, just let the cooked layers sit on the stove until you’re ready to serve it. Then (pay attention, this is weird), put the pan into the oven and THEN turn the broiler. That way, as the oven heats up the food will heat through and THEN the cheese will brown on top. Otherwise you’ll have brown cheese and cold food. Ew. Just….get the cheese brown and food hot, mmkay? Ohhhhhh yes. That’s just perfect. To serve this, I line up the rice, skillet, and toppings and just let people have at it! 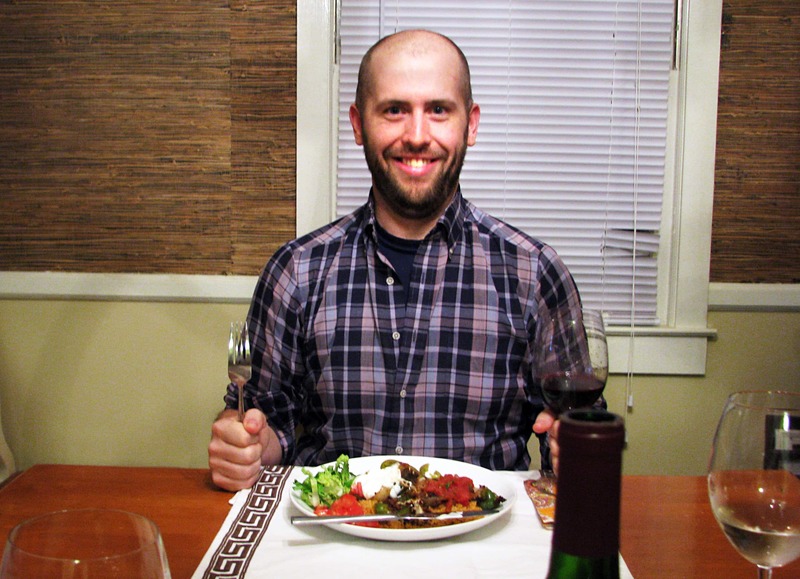 You can do some passing crap on the table with serving dishes, but I find this much easier. 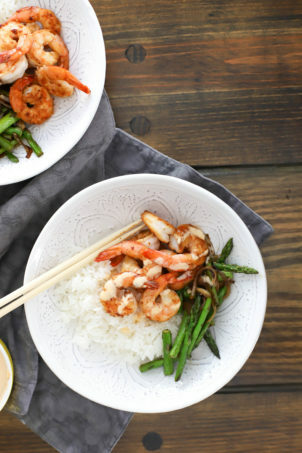 It’s perfect, easy, and delicious. And, the ingredients are cheap! Like I said, last weekend was really fun. Enjoy this one everyone! 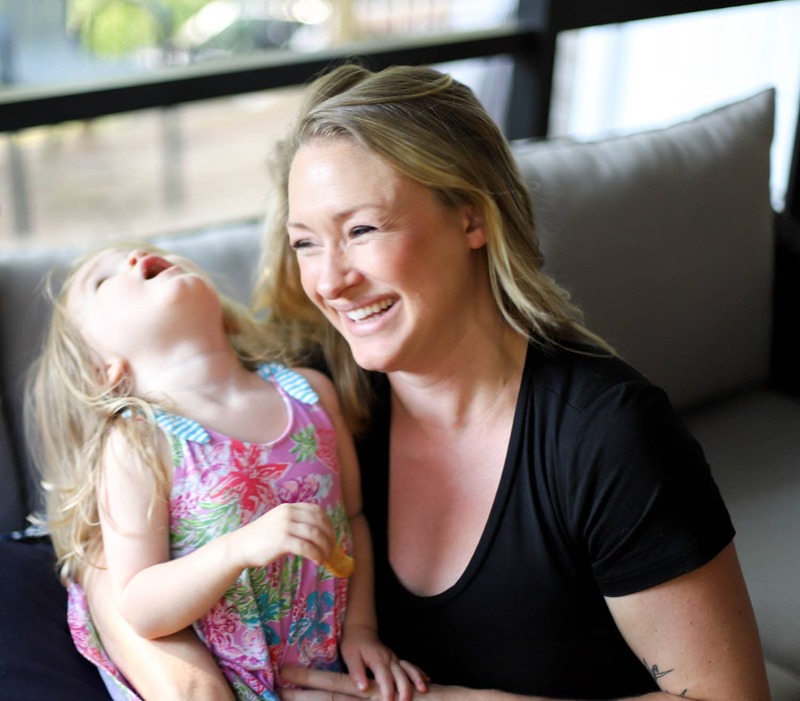 It’s so fun and is perfect for weekends, but it’s also easy enough for weeknights. Change up the meat and veggies for some fun variations – let me know what you come up with!